Infrared angled sensor operated basin tap. Light will illuminate and water will dispense when users hand enter sensor area. Water will stop when the users hands are removed from the sensor area. Water will automatically shut off after 90 seconds of continual use. Mains supply 240VAC to 9VDC transformer. Alternative battery supply with battery box for 6 x AA batteries. 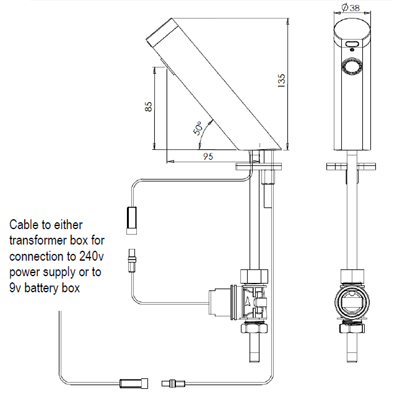 Available as kit for 1, 2, and 3 taps with one mains transformer or battery box. Single inlet for cold or pre-mixed water. Water flow rate 5.4 litres per minute at 5 bar for BREEAM compliance and to achieve maximum water savings. 30mm taphole required, up to 40mm thick. TMV3 mixing valve (regulations state these should be fitted close to the tap and ideally one per tap).